At the 2014 edition of the Pointwise User Group Meeting in Anaheim, California, on 29-30 October, attendees from around the world enjoyed a wide variety of technical presentations, training on the latest capabilities of the Pointwise software, a glimpse of our product development plans, and a celebration of Pointwise's 20th anniversary. Another highlight of the meeting was the announcement of the winner of the 2014 Meshy Award, which is given at each meeting for the most beautiful mesh, both technically and artistically, submitted for consideration. The first day of the user group meeting was a training day. Attendees were the first group outside Pointwise to put their hands on a pre-release of Pointwise Version 17.3, which will have integrated overset grid assembly among many other exciting capabilities. The training covered the overset assembly process for both structured and unstructured grids and how Pointwise can set up the input for and launch the Pegasus and Suggar++ assemblers. Trainees also learned best practices for using the recently introduced hexahedral recombination function available in T-Rex (anisotropic tetrahedral extrusion). The general session day of the meeting kicked off with Pointwise President John Chawner giving an overview of the current state of the CFD/CAE market, where Pointwise's place is in this world, and new capabilities that have recently been introduced in Pointwise. Figure 1: Pointwise President John Chawner kicked off the meeting with a review of the current state of Pointwise. Mr. Chawner's talk was followed by a dozen technical presentations by Pointwise users. Presentations ranged from applications of Pointwise to various physical problems (heat transfer in heat exchangers, aerodynamics of aircraft, missiles and automobiles, performance of gas turbine compressors, volutes, and film-cooled turbine blades) to integration of Pointwise with other CAE software (OpenVSP, SU2, ADS Code Leo, PEGASUS, Suggar++). 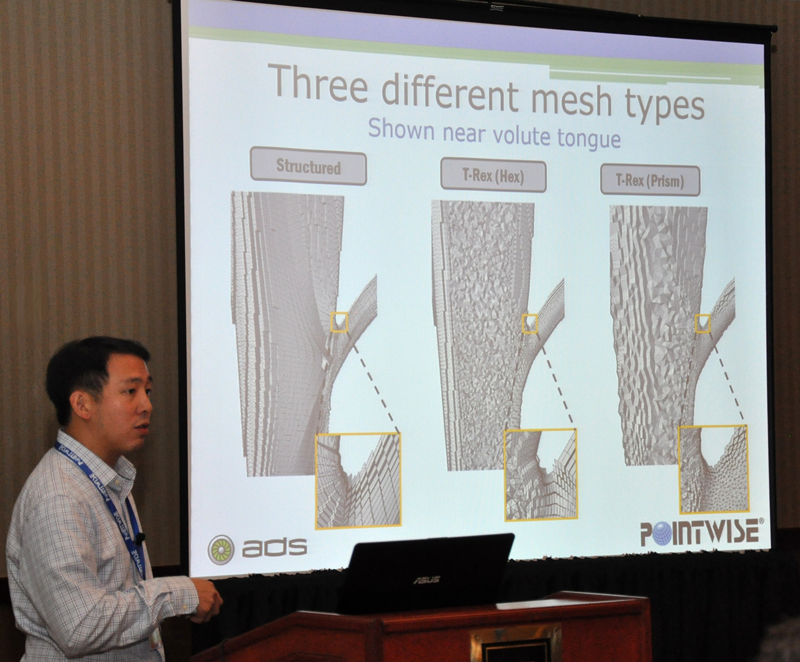 Figure 2: Michael Ni from AeroDynamic Solutions discussed effect of mesh type on CFD solutions for a volute geometry. Jeff Slotnick from Boeing Research and Technology and lead author of NASA's CFD Vision 2030 Study gave attendees some insight into the process used to develop the study and the implications of the study's conclusions for the future of mesh generation. Going forward, mesh generation techniques are going to have to become more automated and more scalable as problem size grows. Adaptive grids will become more important to ensure that important flow features are adequately resolved. It is good to know there is still a lot of grid generation work yet to be done. 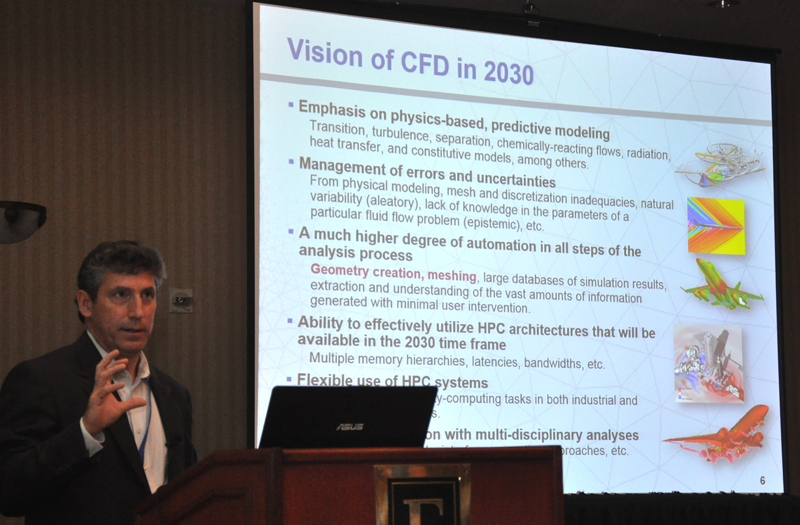 Figure 3: Boeing's Jeff Slotnick gave an overview of the NASA CFD Vision 2030 Study and how it relates to future mesh generation trends. 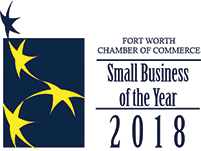 At the CFD Gallery session in the afternoon, attendees were able to visit with Pointwise's exhibiting partners, see a demonstration of a fun Pointwise research project, and hear the announcement of the 2014 Meshy Award winner. Exhibiting partners at the meeting were ADS, Applied CCM, CEI, Engys, Intelligent Light, Metacomp Technologies, and Tecplot. 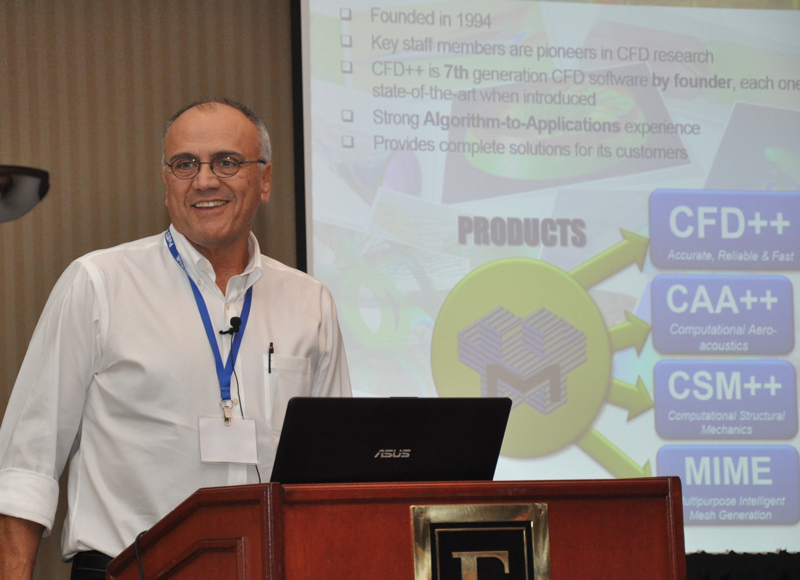 Figure 4: Vedat Akdag from Metacomp Technologies introduced his company prior to the CFD Gallery. During the CFD Gallery, Pointwise demonstrated an exploratory prototype using a Leap Motion Controller for touchless image manipulation and entity selection in Pointwise. The Leap Motion device uses a camera to determine a user's hand motion and shape to use in 3-D motion control. 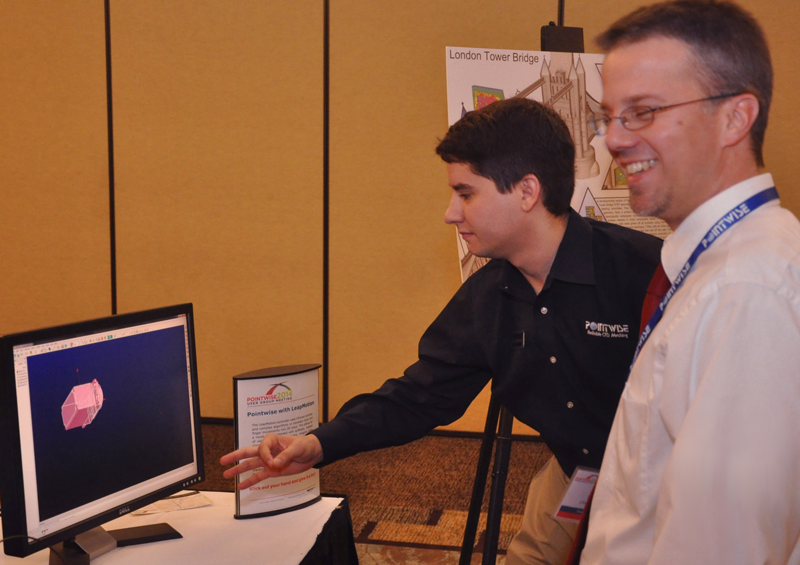 Figure 5: Jeremy Shipman, right, enjoyed the Leap Motion Controller demonstration by Pointwise's Michael Mirsky. Dr. John Steinbrenner, Pointwise vice president of research and development and winner of the original Meshy Award when it was an internal company award, announced the 2014 Meshy Award is Prof. Rickard Bensow from Chalmers University of Technology with his T-Rex mesh of a fully-appended ship hull including rotating propeller. Professor Bensow was unable to attend the meeting so the trophy was mailed to him. All meeting attendees received T-shirts featuring an image of Dr. Bensow's award winning mesh, which can be seen in this announcement. 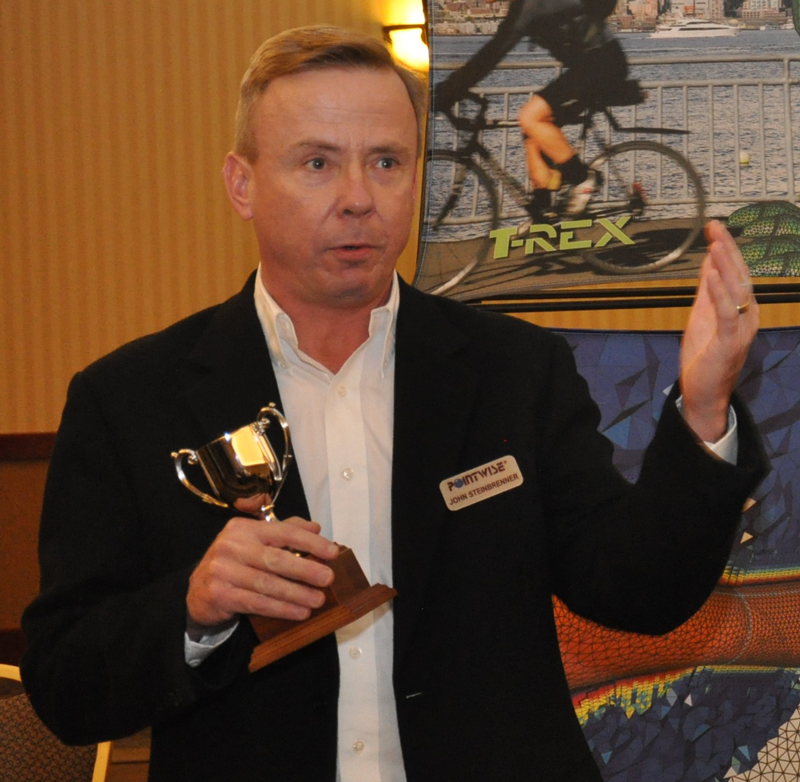 Figure 6: John Steinbrenner announced the 2014 Meshy Award Winner, Prof. Rickard Bensow. 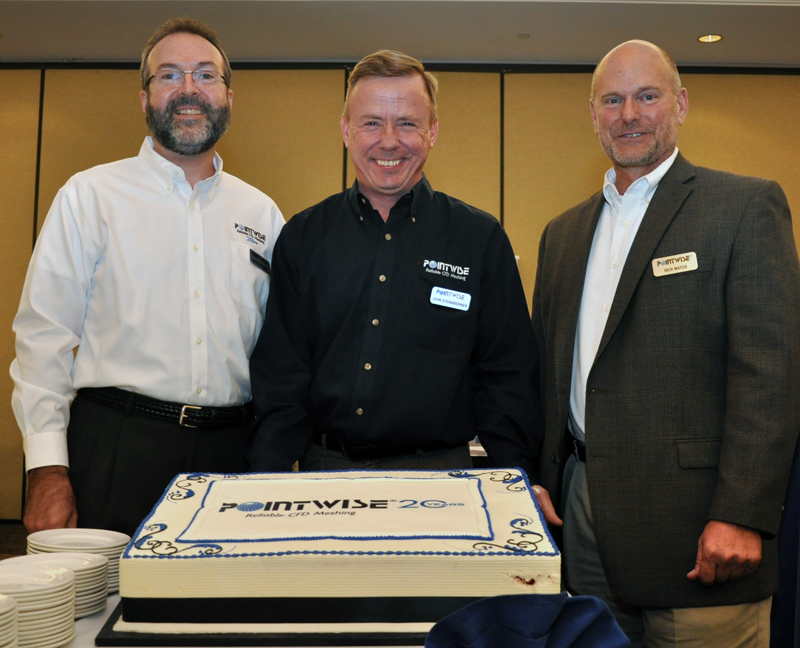 Pointwise, Inc. was founded in November 1994, so the welcome reception on the opening night of the meeting was also an opportunity to celebrate the company's anniversary and thank employees and customers for a rewarding 20 years in business. Figure 7: John Chawner, John Steinbrenner, and Rick Matus celebrated with the Pointwise 20th anniversary cake. 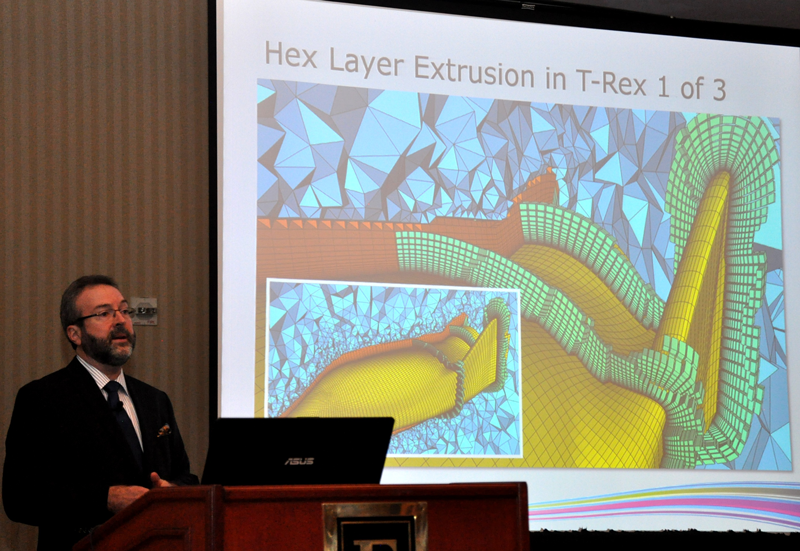 The 2014 Pointwise User Group Meeting was filled with interesting technical content and networking with other engineers. We hope you will join us for future user meetings, whether as a presenter or attendee. You can view a summary of the training topics and technical presentations from this meeting and watch for future events on the Pointwise website. See you there!